There are so many sales people who seem to be successful, because they are always busy, always on the phone, always meeting with prospects but there pipeline doesn’t reflect their activity. Some of them make the phone calls that so many others dread. Others really use their database in a very effective way but sales just don’t happen. It could be a mindset issue that is keeping you from breaking through to others. Being afraid of success is something fairly common in the business world (or on a personal level) but in a sales environment it’s a lot more transparent and easier to detect. The effects are also a lot more drastic, because so many sales people depend on earning commission. Sales people are measured by numbers and if we don’t put numbers on the books it puts enormous pressure on us. What happens next? Usually a frantic attempt to get prospects to sign, rather than taking a step back and reviewing our strategy and our mindset. There is nothing more annoying or aggravating than an over-eager sales person. Once we become desperate, sound strategy usually goes out the window. There is a great book that I recently read “The Big Leap” and it was mind opening to hear how often we trip ourselves up because we feel that we don’t deserve. If we feel that we don’t deserve, we will have a difficult time asking for money. And asking for money is necessary when closing a sale. All the activity in the world will not help us if we deep down don’t think that we are worthy of the business. Sound too earthy? Well, it’s taken me a long time to realize that most of my slumps came from within me. Whenever I was able to catch myself and I reconnect to my core by being positive and putting out positive energy the results were simply amazing. Sales people who are afraid of picking up the phone and cold calling are usually afraid of being rejected. Sales people who do “everything” right but still don’t close the sale need to look at why it is happening. Sometimes, there are other reasons but don’t blame the economy. There is still plenty of successful sales people out there, selling in-spite of this business environment. Maybe it is your mindset?! It’s worth a thought………….. Inquire about Mindset Sales Coaching at monikad@consultativesales.net. 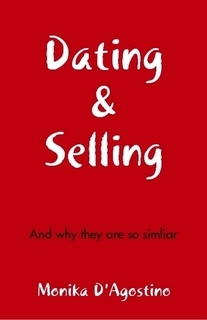 You can now buy my book Dating & Selling and why they are so similar.